Successfully Added Sunroad FR1001 Outdoor Watch - World Time, Countdown, Stop Watch, Backlit Display, 3ATM Waterproof, Alarm Clock to your Shopping Cart. The Sunroad FR1001 sports watch comes is excellent companion wherever you go thanks to its 3ATM waterproof rating. With a full complement of timing features and exquisite manly design its a real treat at such a low price. This watch allows you to choose between 12h and 24h timing modes and furthermore treats you to an agenda to keep track of the date. With its world time function, this outdoor watch allows you to track the times in different time zones. This comes in particularly handy for those of you who often travel abroad and wish to keep track of the time back home. To further increase its usability, the watch treats you with a stopwatch, alarm clock, and regular countdown timer. Thanks to its backlit display, you’ll be able to enjoy all its features at both day and night. The watch itself is ATM3 waterproof, meaning you can use it with confidence in any environment. 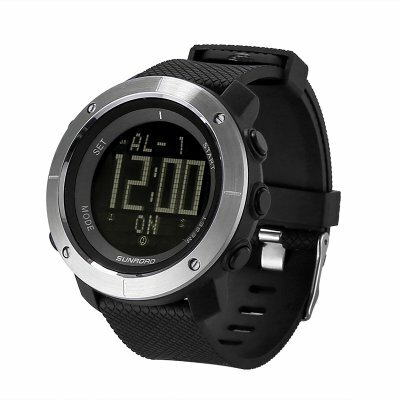 Whether you’re at the beach, forest, or mountains – this sports watch will follow you anywhere you go. The Sunroad FR1001 outdoor watch comes with a 12 months warranty, brought to you by the leader in electronic devices as well as wholesale watches and outdoor gadgets.